These lightweight (less than 7 lbs. ), compact (less than 160 cubic inches), fully enclosed/shielded power converters deliver either 24, 36 or 48 volts d-c, to run distributed power systems, motors, actuators or heaters. Their universal a-c input (85-265V a-c) is at home with either 115V a-c or 230V a-c, though they produce significantly more output at the higher input voltage, and should be run from 200-240 volt mains wherever possible. Power factor correction is standard, as is full compliance with all international safety and EMI standards. RKE are RoHS (Reduction of Hazardous Substances) compliant. Units may easily be paralleled for greater power. Current sharing is built-in. RKE's MOSFET switch operates at a switching frequency of 140 KHz to provide well over 80% conversion efficiency. Their clean d-c output features both overvoltage protection and overcurrent limiting for intrinsic safety. 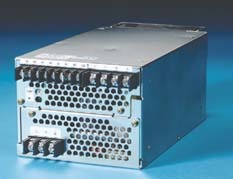 RKE models can be mixed with your choice of Kepco modular power supplies (e.g., AE, AEK, AK, GE, RTW, HWS, SWS, HSM) and programmable linears (PTR, JQE, PAT and packaged in one of our standard rack adapters for a custom power solution you design yourself. Or, if you chose, give us your specs and we'll design it for you.